The saying is very true lose it or use it…. we see many examples of people carrying on doing what they love – and age is a complete irrelevance. 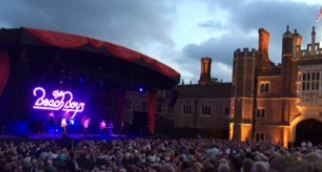 Last night was a great show of energy at Hampton Court with the Beach Boys. Song after song with no breaks for just over an hour and a half. The audience with an average age of around mid 60’s and upwards were all on their feet for most of the time really rocking away….. The continuous stream of photos and video playing at the back showed all the boys in their youth….yes they did look very young and what a contrast to the physical bodies on the stage but you can well believe that those performing and those that were listening all felt exactly the same in their hearts as they did 40 or so years ago. So embrace the life and health you have and enjoy it – who cares if we don’t have the bodies of 20 year olds – it’s what’s in our hearts and our joy of life that matters….